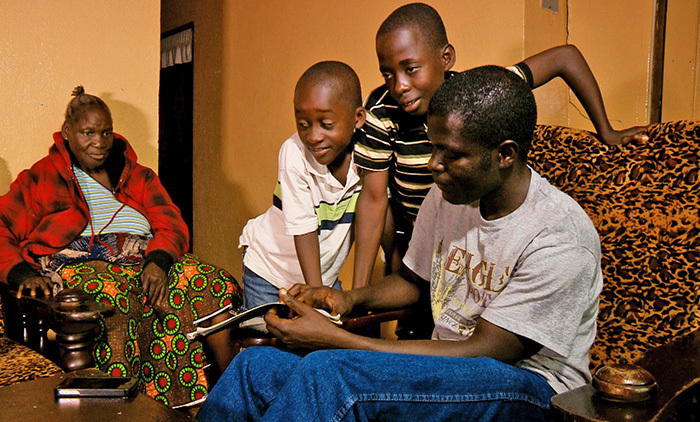 For Emmanuel Urey, a graduate student at UW-Madison, having to choose only one of his three children living in Liberia to bring to safety transformed Ebola from a disease into a personal nightmare. In the midst of the Ebola outbreak in his hometown of Monrovia, Liberia, Urey found himself constrained by travel restrictions and stereotypes when he tried to bring all of his children safely back to Madison with him. Gregg Mitman, a Professor of History of Science, Medical History, and Environmental Studies and member of the Global Health Institute Advisory, captures Urey’s personal experience in Liberia and Madison in the documentary, “In the Shadow of Ebola.” With the film, Mitman offers a sharp contrast to the crisis portrayed throughout most of the media coverage on Ebola. “In the Shadow of Ebola” will be playing at the Wisconsin Film Festival at 11:45 a.m. Saturday, April 11, and 11:30 a.m. Sunday, April 12. The film trailer is online. The documentary weaves together Urey’s personal story with the story of a nation, as Liberian perspectives and voices come together to connect Ebola’s lasting effects across borders. The film ultimately highlights the importance of history, public health infrastructure, and trust in addressing the Ebola outbreak. Without a full understanding of Liberia’s history with civil war, outsiders are unable to fully grasp the context of disease within a country transformed by mistrust, Mitman says. Ultimately, understanding the biology of Ebola is necessary in combating the virus’s spread, but understanding cultural attitudes and behaviors is just as important in developing effective public health campaigns. The documentary highlights efforts of health care workers, volunteers, radio DJs, and musicians to show how Liberians were empowering themselves and confronting the disease when the international community was slow to respond. “In the Shadow of Ebola” shows the impacts of restricting travel not only for Liberians trying to leave the country, but also for trade. Travel restrictions, roadblocks and fear, for example, also decreased the movement of food and supplies, which is ultimately disastrous for the Liberian economy. “In October, there was discussion in the U.S. about instituting a travel ban on West Africa without any consideration of how such a ban would impact the economy and food supplies of Ebola-affected countries, like Liberia,” Mitman says. Mitman was in Liberia filming a different movie in Liberia with Urey in June, when Ebola first hit the city of Monrovia. 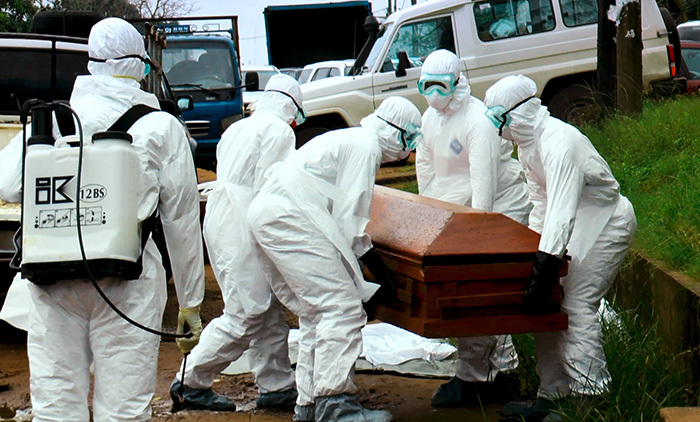 The team put the other film on hold as they recognized the severity of the growing outbreak. “We came to personally see and feel, through the struggles that Emmanuel and his family faced, the far reach that Ebola had,” Mitman says. Urey is a graduate student in the Environment and Resources program in the Nelson Institute for Environmental Studies at UW-Madison focusing on indigenous rural land management and agriculture. With a passion for teaching, he hopes to use his education and experiences to one day establish an environmental program at the University of Liberia. 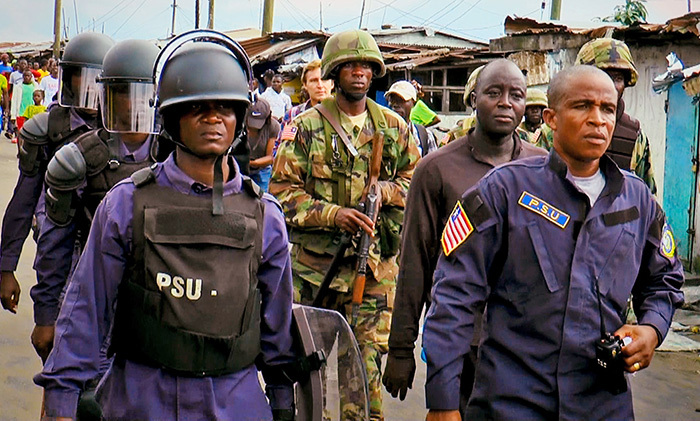 While most of the focus on Ebola in Liberia may be on a country struck by hardships and misunderstanding, this film showcases the resolve and resilience of Liberians in combating the epidemic, Mitman says. Posted in Advisory Group, Health Systems, News, News - Home, One Health, Our People. Our Projects.